The new approach is very straight-forward: Creating a simple "Hello World" project takes less than 2 minutes to set up. Even more advanced tasks, such as creating tables or charts automatically, do not take much longer. For me "Power to the User" means that each Excel user should be able to do things for which typically coding from a VBA guru was required. What a great improvement of efficacy and efficiency in daily work this would mean for many users, when excessive copy & paste from Excel to Powerpoint comes to an end. 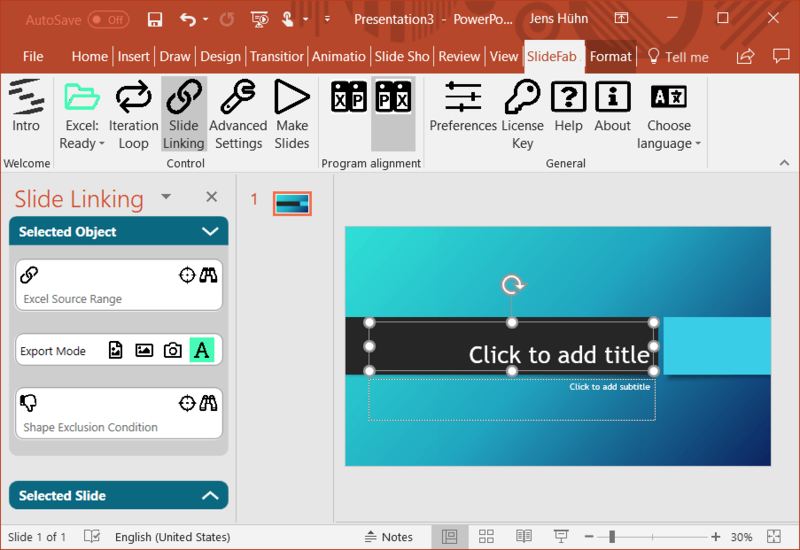 The most prominent novelty is that the new SlideFab 2 is now seamlessly integrated into the Powerpoint application window. This simplifies setting up the interaction between SlideFab and Powerpoint objects such as shapes, tables or charts. 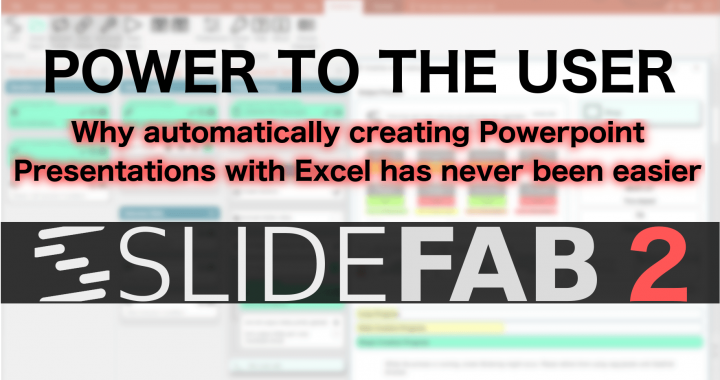 Moreover, when it comes to linking between Powerpoint and Excel, SlideFab relies on a very simple but easy to use approach: First of all, it aligns the Excel window next to the Powerpoint window. Then it let's the user select an Excel range and insert it into SlideFab 2 with a simple click of a button. As linking to Excel cells via address (e.g. 'Sheet 13'!$X$2:$Y$4) is not optimal, SlideFab recognizes named ranges and tables. If this is the case, SlideFab uses named ranges, table names or column names as more robust linking approach. This way the user can change the Excel model (e.g. inserting columns, moving ranges) without having to update these links. When everything is set up, SlideFab 2 will show the slide making progress in a neatly arranged preview window. This way the user can check the output quality and intervene - just in case - while the process is still running. Beyond these three areas, there are further novelties and improvements in SlideFab 2 over its predecessor, e.g. To enjoy the full experience it makes sense to try it yourself. And here comes the good news: You can acid test the full version of SlideFab 2 for 30 days without any risk.